AT – PA Swatara Gap – ??? It’s Hot, It’s a Ridge, and It’s Rocky…And I love it! This summer I am set to complete the Pennsylvania section of the Appalachian Trail. I am about half way through the state, having completed Pen Mar through Swatara Gap in May 2014. In June I am backpacking a big section with my backpacking pals, Google & Cindy…but I can only go for a week. This initially meant that I would not be able to cross the PA/NJ line with them. This was disappointing to me as Google crossed the GA/NC line with me, and I crossed the MD/PA line with her. So I am throwing myself into completing a few extra sections before our planned backpack! My intent is to get to Port Clinton before our backpack. Since I live in Maryland, each trail head in this area is about 1.5 to 2 hours away. Not a short drive, but I am DRIVEN to do this!! Cindy, who is a PA gal, has generously offered to hike some of this with me so we can do some shuttle hikes. Until then…this was an out and back hike I took about two weeks ago starting at Swatara Gap headed north. I parked on Rt. 72 by the Iron Bridge in Swatara State Park. There is a larger parking lot on the east side of the bridge. Love to discover old bridges! 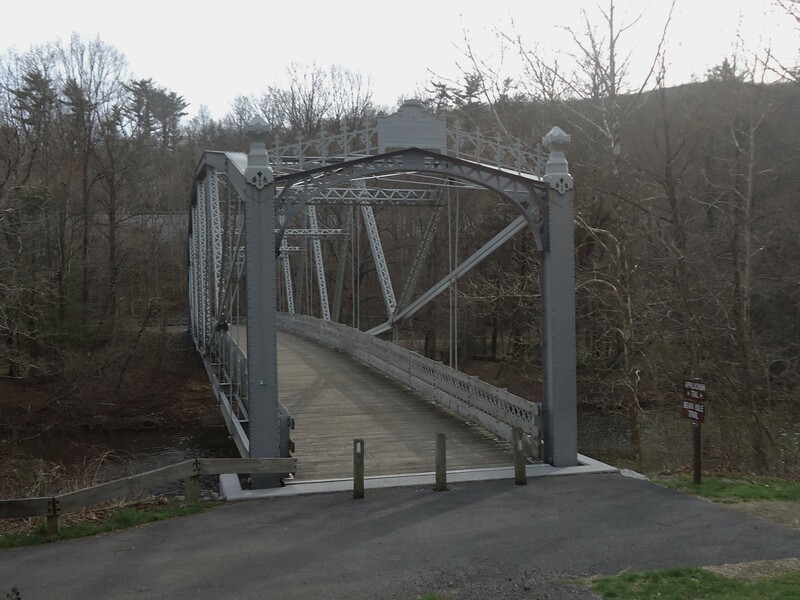 After crossing the Iron Bridge you initially turn left, then right to walk through the parking lot and continue on the road to the AT. This is nice and flat and parallels the creek. 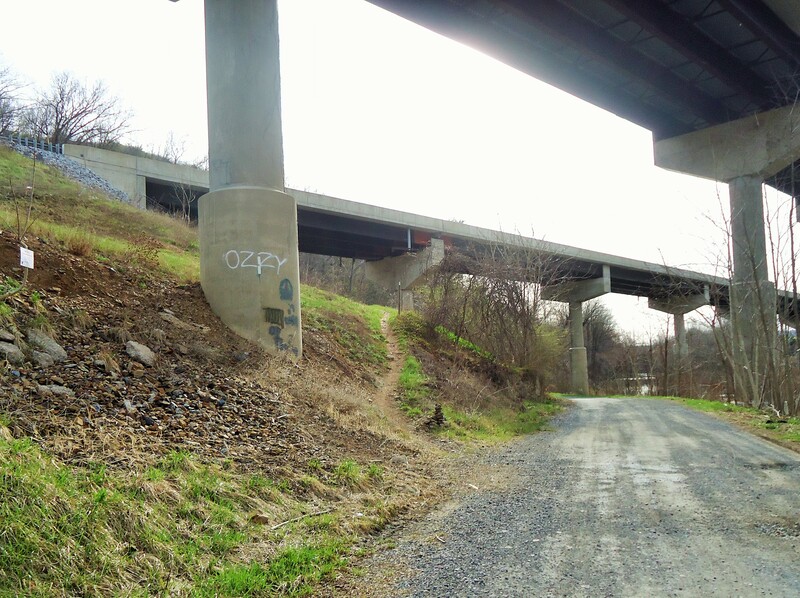 Once you go under I-81, the AT shoots off to the left up the hill…the beginning of a long climb! Trail goes right under I-81 then veers uphill to the left. A guy who was backpacking passed me and made a comment about the PA rocks. He seemed acutely familiar with them as he continued to rant how they were much worse here than in the northern section of MD. I didn’t have to be told that! He was moving fast though and was soon out of sight up the hill. 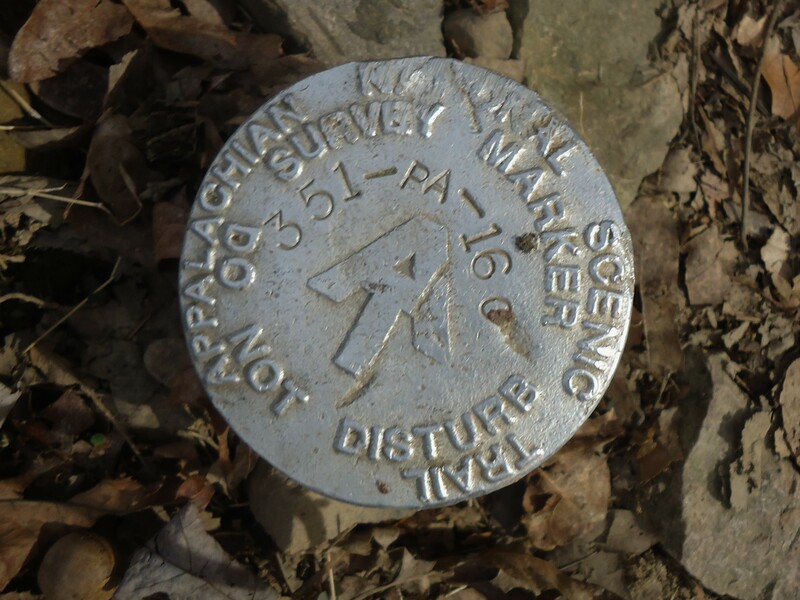 Ahhh, my favorite type of find…a survey marker. I stopped at a campsite about half way up to give Sidekick Pauli some water and take a break. Gosh, the woods were beautiful this morning. Spring had made its way to the mountain with the underbrush greening up, the birds chattering and a nice breeze singing through the branches above me. What a lovely place, even with the rocks! Sidekick Pauli taking in the view of Lickdale from the ridge. After making the ridge, I heaved a sigh and took off a layer. It was sunny up here on the ridge and the warmth of the sun made me feel so entranced…I lifted up my head, closed my eyes and just soaked it up for a few minutes before continuing along the ridge. Then the ridge got warmer and warmer until all of the sudden it was HOT. The beautiful breezes continued throughout the hike, but wow, we drank a lot of water! I had 5 liters in the pack for Sidekick Pauli and myself (yeah, that made the initial climb a little harder 🙂 ). When she had gone through 2 liters, it was time to turn around!! By the time we got back to the car, I had also gone through 2 liters as well. Always bring enough water when hiking with a dog! I took photos of the turn around point so hopefully I will recognize it when I hike in from the other side. 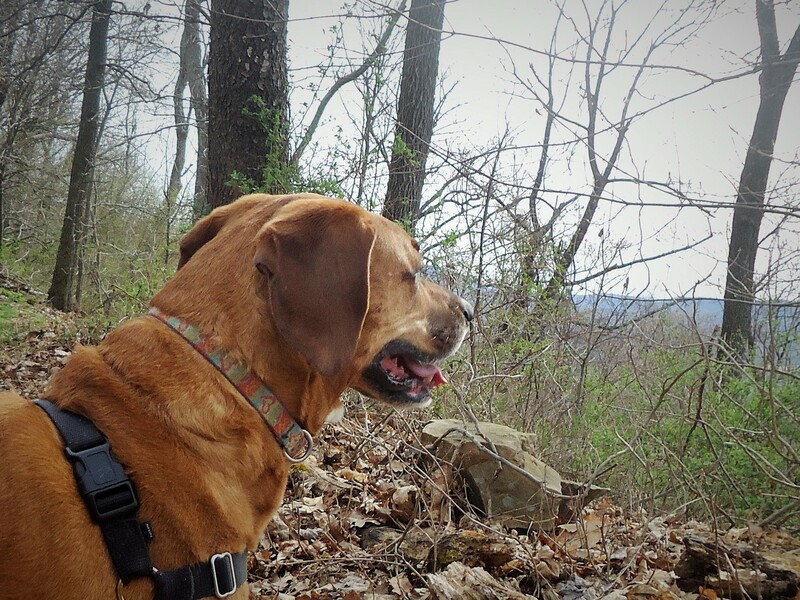 It will be a longer hike than this one, and I will not take Sidekick Pauli along! She has her limitations! Hot Rocky Ridges and All…Hike on! This entry was posted in AT-Pennsylvania and tagged Appalachian Trail, Appalachian Trail Pennsylvania, hiking in Pennsylvania, hiking near Harrisburg Pennsylvania, hiking Pennsylvania, hiking with dogs, Outdoors, outdoors Pennsylvania, section hiking, Swatara Gap, Swatara State Park, trails, walking.